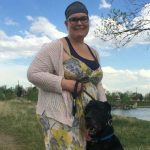 Luna has a home with Emily in Centennial, CO. Luna will be Emily’s first Giant Breed Dog ever! She has a few friends and acquaintances who have Great Danes and she absolutely fell in love with their gentle nature and sweet dispositions. Emily will be able to spoil the heck out of this sweet girl as she will be the only one in the home and will have Emily’s 100% undivided attention. Lucky girl! Emily is looking forward to sharing her couch, bed and over time working with Luna on bringing her to work with her.